Jim is a rare artist, uniquely qualified in his use of color, composition and perspective. 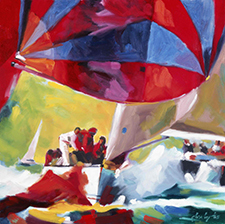 The spirit and honesty of his colorful, usually action-oriented marine art reflects both his prodigious artistic skills and his long and successful career racing sailboats. Jim brings his artistic talent, unflagging spirit and zest for life to all his artwork, no matter what his subject matter. The AC34 US team capsized their much anticipated 72 footer while practicing on the Bay in late 2012! Close reach in blue water. The yacht Adventuress sailing downwind. Giclee Print "Adventuress Under Full Sail"
The yacht Adventuress under full sail. Giclee Print "Ahead at Mark #4! Final AC34 mark rounding, Team USA snatched victory from defeat in a breathtaking display of sailing skill, technical prowess and sheer determination. America "Cubed", skippered by Buddy Melges, winner of the America's Cup in 1992 in San Diego. Giclee Print "America3 1992 - AC Winner"
Giclee Print "Approaching the Gate"
Ocean racing yachts coming in under the Golden Gate. Team Artemis - Americas Cup World Series, SF Bay 2012. The yacht, Athene, in 1964, the year she won the very first Big Boat Series. Yacht at sea under chute, on the horizon. Yachts racing under the Golden Gate, spinnakers flying. Giclee Print "Baker Beach View"
Seldom seen view, just outside the Golden Gate Bridge, from Baker Beach. Giclee Print "Big Red Chute"
Giclee Print "Biking in Marin"
Racing in under the Golden Gate. Racing on San Francisco Bay toward the leeward mark, in the shadow of the Golden Gate. 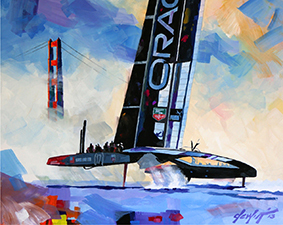 Giclee Print "BMW Oracle Racing US 17 - AC33 2010"
BMW Oracle team's yacht, US 17--a 90' catamaran with a rigid wing sail--successfully challenged Switzerland's Alinghi 5 in 2010, bringing the America's Cup to the Golden Gate YC in San Francisco. Giclee Print "City by the Bay"
Yachts racing off the City front. Team NZ loses their jib, but wins the race! - Louie Vuitton Series, SF Bay 2012. Giclee Print "Coming and Going"
Giclee Print "Coos Bay Tug"
One especially gorgeous weekend in Coos Bay, Oregon. Giclee Print "Ducks in a Row"
America's Cup World Series competition on SF Bay in 2012. Giclee Print "El Toro Nationals"